My brother is a stunt man, performer & entertainer who is looking to make a transition into events – event management within the extreme sports and entertainment arena. He knows a lot of people in this area and has been contracting to a few companies whilst looking for something permanent. After an overseas holiday he returned to Melbourne and was told that someone would contact him in a few days as two of the guys he had been working with have recommended him for this job and the company owner would be calling to set up an interview. He was telling me this on Friday (when he arrived on the Gold Coast to surprise mum for mothers’ day) and then on Sunday night I had a dream – about this – and online reputation management – weird really. In my dream I was presenting to a group of (mainly) men (which isn’t really my market) – they were just like my brother – stunt men, performers & entertainers who mostly get their work through recommendations and people who know people. Sadly many of them are not tech savvy and hence probably never thought about their online reputation or what happens when someone ‘Googles’ them. In my dream and even when I thought about it after waking up, I came up with 6 steps which all experts including stuntmen need to be aware of. Go on, I dare you. I hope you aren’t silly enough to think that people aren’t Googling you, because they are. The first thing I do when I connect with someone new at a networking event, online or if I have an interview/sales meeting with them is to Google them. It’s essential to make sure that you don’t have any damaging articles or images that people might find. Sometimes Googling yourself doesn’t provide all the results, and let’s face it, Google search is now somewhat personalised to each and every person (which means you might see something different to what I might see), so you also need to be monitoring your name online. You can do this using a handy free Google tool called Google Alerts. Sign in with your Google Account and set it up today. Many Facebook users don’t understand Facebook privacy and have lots of their Facebook personal profile open, which means it isn’t private any more. Go through your privacy settings and make sure that most of the settings are set to “Friends” only, then be careful who you add as friends. Facebook also has the option to group your friends into lists. You then have control and can share certain information with different lists. This is ideal if you want to use your personal profile to connect with business people. I would recommend logging out of your account and navigating to your account just to see exactly what a non friend will see. Following on from protecting your privacy on Facebook you want to make sure that your profile is set up correctly to optimise your business or employment success. Even if you don’t have a business we are all marketing the “Brand of You”. There are certain elements of your profile you will want to keep open and optimise these – as your personal profile can come up in a Google search of your name. These include; current location, about section, contact information, websites, link to your Facebook page (if you have one) and your employment. These areas should be visible to all so they can find out the information required to offer you that next big opportunity. As a side note you may also like to create your own Facebook Page and use it just for business (or employment) related information. This will help you keep everything separate, organised and they rank very well in Google. Everyone, and I mean everyone, should own their own name as a domain. When my sister was 10 I purchased her name as a domain name (I know 10 years a little late), but you never know what the future holds and domains are like property. Once they are gone they are gone. You can never have too many and they are dirt cheap, it’s silly not to get your name and different variations. For example I have nataliealaimo.com, nataliealaimo.com.au and I even have nataliealcock.com (in case my partner ever asks me to marry him). You just never know and for like 40 bucks for 2 years (and sometimes cheaper) it’s worth the investment. Websites have come along way in recent years and people don’t want to land on your site and see last years news. Using a blogging platform like WordPress you can quickly and easily create your own website and keep it updated regularly with your current work, projects and adventures. Use a mixture of personal and business and don’t be afraid to show your personality. Even if you are working for someone else you can still share your individual projects and insights into what you are doing. This way people can see your experience and expertise. All of your online profiles – Facebook, Website etc. (maybe LinkedIn & YouTube) should be optimised for your keywords. So what are your keywords – firstly it will be your name and different versions of it. Natalie Alaimo, Nat Alaimo, Natalie Alimo. Then it will be the major keywords which describe your industry or skills. Use Google Free Keyword Tool to find the exact words and phrases people are searching for. You might find that more people are searching for stuntmen vs stunt performer and ideally you want to optimise for what the majority of people are searching for. Whilst this example was for the entertainment, performer industry these tools can be used by anyone who is looking to optimise their online reputation and make sure Google only says nice things about them. 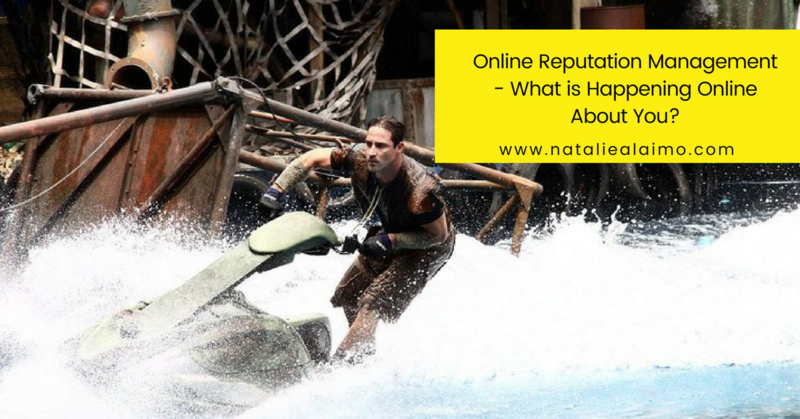 How is your online reputation looking? I would love to hear about your experiences with any of these tools or managing your own online reputation. « Previous Post How To Link Directly To One Facebook Post Next Post » Facebook Page Admin Roles – Who, What & Why?